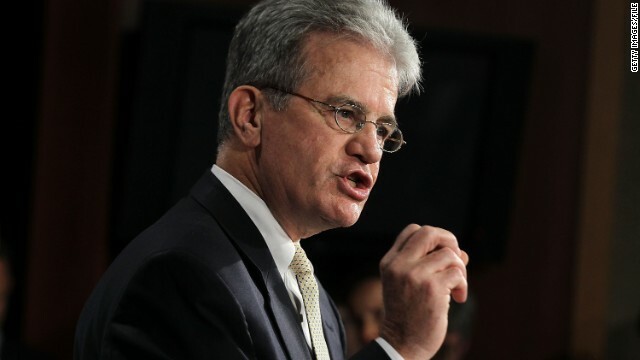 (CNN) – Sen. Tom Coburn became the latest Republican lawmaker to link President Barack Obama to potential grounds for impeachment during a town hall Wednesday. The Oklahoma Republican – who also said Obama was a "personal friend" – responded to a question from a constituent by asserting that the president's policies were approaching a legal standard for impeachment. Without using specifics, Coburn cited "intended violation of the law" by Obama's administration, as well as general incompetence of some of his appointees. "I don't have the legal background to know if that rises to high crimes and misdemeanors – but I think they're getting perilously close," Coburn said, according to a YouTube video posted Thursday. He also acknowledged that as a senator, he wouldn't play a role in proceedings until the House voted to impeach Obama – but still said he was keeping track of potentially impeachable offenses. "I'm documenting all this as it does along," he said. "I don't know where that level is – I'm kind of like the lady in the back. I'm fed up. I'm frustrated. I'm happy to raise an issue at every point." "He's in a difficult position he's put himself in," the Republican lawmaker continued. "And if it continues I think we're going to have another constitutional crisis in this country in terms of the presidency." The idea of impeaching Obama has come up several times recently, including when Republican Rep. Blake Farenthold told his Texas constituents earlier in August that the House of Representatives "could probably get the votes" to impeach Obama. And in a video posted online Tuesday, Rep. Kerry Bentivolio of Michigan responded to a woman during a Q&A session that "if I could write that bill and submit it," he said, moving to impeach Obama "would be a dream come true." CNN's Bryan Koenig contributed to this report. obama has been a fraud from the start- he needs to be ridiculed out of office.... admitting to as he said "my muslim faith". If given the choice of voting for a muslim or a klansman for POTUS, I'd pick the muslim. Most muslims are honest, decent people who live simple, quiet, peaceful lives. I'm not sure if I can say the same about a klansman. Great job Coburn. You aren't a lawyer, You don't know the threshold of evidence needed. You haven't even been able to state one instance where the President may have even broken the law, regardless if it fits into the category of high crime, but yet you are ready for impeachment. Seriously, members of the GOP have become more and more of a laughing stock each and every day. Since they keep bringing up impeachment talk, maybe we should move ahead with it – but not against the President, but instead against every GOP House and Senate member who has acted in a treasonous manner by trying to destroy this country. Every GOP member that doesn't agree with raising the debt ceiling, thereby breaking the 14th Amendment should be put on trial. Every GOP member trying to block people from voting should go on trial. And every GOP member who pushes their religious beliefs on America, infringing on the 1st Amendment should also stand trial. At that rate, we can get rid of all of them and actually get something done. Uh-oh. Mr. Coburn just shattered my laugh a meter. What to do ... what to say? Where have all the GOPers gone? Long time passing. Where have all the GOPers gone? Long time ago. Where have all the GOPers gone? Moderates pick them every one. Don't worry about the Middle East Obama a bus tour is much more important. Another reason that the people that voted for this no leadership president should worry. The Republicans won the House again for a reason to keep Obama in check. they won it through gerrymandering, and with fewer votes overall than their Democratic counterparts. If you keep saying they won through gerrymandering and not because of the massively unpopular Obamacare mandate enough you may start to believe it. I'm so surprised at what Coburn said. He was of the GOP I respected that comment really hurt.. I am a demorat however there some GOP I truly like. What is going with our country it sad and disgraceful. I have no job nor insurance and all they do is bicker about is crap. I'm tired lets impeach everyone in congress should be impeach. All I need to know what have this president done to be impeach whether you like him or not what has he done. Congress is fully complicit in : I.e. "Patriot " Act and subsequent crimes by the NSA. And yes, the NSA has committed crimes. At the least, they've lied to courts on several occassions.